In this report, SlashData answers the simple question: how many software developers are there in the world? 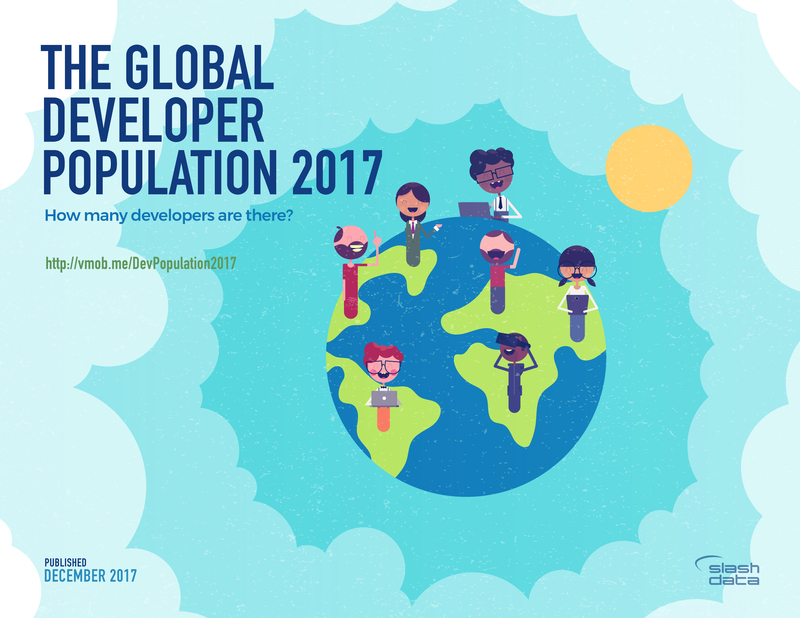 We estimate that in the middle of 2017 there were just under 15 million active software developers globally, out of which 11M are software professionals. Our estimate is derived independently, using a bottom-up approach firmly rooted in reliable measurement. Any estimate has some degree of uncertainty associated with it, as well as embedded choices and trade-offs, and should be used with an appropriate level of care and precision. In this report, we discuss in depth what the key sources of uncertainty are and how we have mitigated them. In particular, “developers” are on a continuous spectrum of involvement with coding. The arbitrary choice of who counts as a developer is a source of fundamental estimation uncertainty. Another source of uncertainty is measurement bias, in particular from the regional nature of our base sources, as well as potential biases in our survey data. () Spoiler alert: it isn’t. Developer Economics 13th edition is a large-scale online developer survey designed, produced and carried out by SlashData over a period of nine weeks between April and June 2017. The survey reached an impressive 21,200+ respondents from 157 countries around the world. As such, the Developer Economics series continues to be the most global independent research on mobile, desktop, IoT, cloud, web, game, AR/VR and machine learning developers and data scientists combined ever conducted. Respondents to the online survey came from 157 countries, including major app, machine learning and IoT development hotspots such as the US, China, India, Israel, UK and Russia and stretching all the way to Kenya, Brazil and Jordan. The geographic reach of this survey is truly reflective of the global scale of the developer economy. The online survey was translated into seven languages in addition to English (simplified Chinese, Japanese, Korean, Portuguese, Russian, Spanish, and Vietnamese) and promoted by 82 leading community and media partners within the software development industry. How many software developers are there? Who is considered a developer?